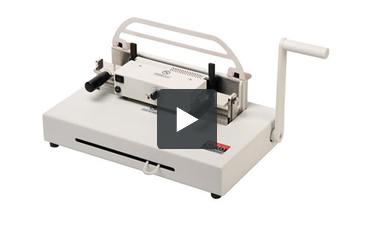 The hot stamping press allows user to foil stamp up to 3 lines of 5.5mm text in four positions or a logo on any 8.5 x 11" MetalBind hard and soft cover. This allows you to customize any cover yourself without needing to outsource to another company. Welcome to MyBinding video. This is the Atlas 300 Image, a metal binding system by Opus. Binding superior-looking books is incredibly easy on the Atlas 300 Image. 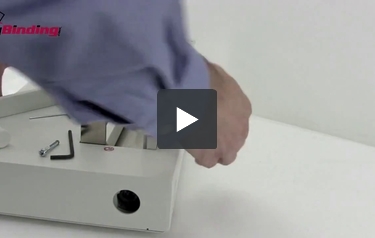 This video will walk you step-by-step through that entire process of binding a book. Upon selecting your covers, find the beveled edges. This is where the spine, or the channel, will go and make the bind. Place your pages to be bound inside the book and jog it all nice and centered and into place. Use the channel width selector to help you decide the exact right size channel spine you need. You'll notice that one side is curved and the other is straight. That curve side goes toward the back of the machine underneath the measuring tool and slid all the way to the right. When metal binding, make sure that the front cover is faced toward the back of the machine. Give your pages a little jog and center again, and place the whole thing down into the channel. Slide it all the way to the right and close it clamped shut with the wedge on the front. Pull the handle all the way down until it stops, release the handle, release the wedge, pull your book out, and you're all set; it's perfect. And that is how to bind a hard bound book with a metal bind on the Atlas 300 Image by Opus. For more demos, reviews, and how-tos, check out MyBinding.com. Welcome to MyBinding video. 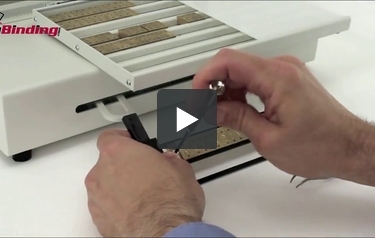 This is the unboxing and assembly of the Atlas 300 Image, a metal bind binding system by Opus. Everything you need to bind great looking books is right here with the Atlas 300 Image. All the parts you need for full size binding and a simple yet very effective hot stamping method, the ImagePress. You get a starter kit that has tweezers, screwdriver, one carriage, and a few pieces. You can always add to your collection more fonts, sizes, symbols, and numbers. In your box you'll receive one starter pack of foil slips, an instruction assembly book in many different languages, as well as a starter pack of covers and channels. This is to get you started and give you an idea of the kinds of photobooks and books, both hardcover and softcover, that are available to you. There's custom covers, hard and soft, covers that you can laminate materials right into, and plenty of colors and extras with corresponding channels, which are the metal spines. Step-by-step, here's how to assemble your Atlas 300. First off, turn the machine around to the backside. You can spin off these two knobs and replace it with the fence. The fence then goes right down on top and tighten the knobs back down. They are a quick release so that means they're adjustable for your different projects. The next step is to take the main handle, find the threads, load it into the side of the machine, and put the screw in after it. Use the larger Allen wrench to tighten it down. On the left side of the machine are two stowaway slots. The first one holds the two rulers, or backstops, and the other holds the debinding tool. Depending upon the size and thickness of your project, different backstops are used right here to hold your paper in place. And they're stowed back in the same compartment. The debinding tool is for use for editing should you need to redo a project. Three small magnets are on the underside of the channel width selection tool, which allows you to store it anywhere on the machine that you'd like. Finally, there is the ImagePress. This is the heater element that allows you to do your image stamping. When you've created your image to be stamped, you place it over the heater. These are two additional adjustable fences that allow you to secure a book in the same place over and over again for a repeated project. And finally, a little white stand that allows you to place your rack right on top of it and make your stencils with much more ease. There you go, that's how to assemble your Atlas 300 Image. And you're on your way to binding a great many books. For more demos, reviews, and how-tos, check out MyBinding.com. Welcome to MyBinding video. This video will show you how to use hot foil stamping with the Atlas 300 Image. It is as impressive as it is easy to stamp virtually anything on any cover. Step-by-step, here are the basics. This is the hot stamping heater, it slides right in the front carriage and hooks on by magnet. Once plugged in, you can power it on and adjust the temperature here with this dial; the ready light will go on when it reaches the temperature. Your Atlas 300 came with a starter kit of stamping tools. You'll need to use the rack as well as the tweezers and the screwdriver. Plenty of fonts characters, numbers, and designs can be purchased through MyBinding and can be stored in a special rack to keep things nice and clean and orderly. With the tweezers, remove individual letters and place them in the rack. Once you've spelled out your design and set it in place, screw it down to hold it in place with the two screws on either side. Double check your work and with the flat side facing you, put the entire carriage down over the slots on the sides. Use caution; hold it by the plastic handles, because if you've already turned the heating unit on, it will be hot. Select the color of hot stamping foil that you'll use; pull one sheet out. With the color side facing you, lay it down just beyond the stamp and before the back wall. Use the small magnet to hold it into place. And then, with your previously bound book, place the front cover facing toward you exactly where you want it, close the wedge in the front, and complete the process by pushing down on the lever all the way, hold for a couple of seconds, and release the lever, release the wedge, slowly peel back the foil, and you're all done. There it is, that's hot foil stamping on the Atlas 300 Image. For more demos, reviews and how-tos, check out MyBinding.com. We are setting up a small retail print shop and will be getting your usual coil, wire, comb binding machines. we are also considering a metal bind Atlas machine. Is this style becoming more main stream or is it very nitch? Is it growing in popularity? Thank you for your question. While a solid binding option, metal channel binding is less popular than the binding options that involve punching such as coil and comb. One of it's greatest strengths is that the binding process doesn't involve prepunching the stock which cuts down on the time and labor of the binding process. Thank you for your question. This price is for the Metal Bind Finisher only. The Hot Stamping Device is sold separately.